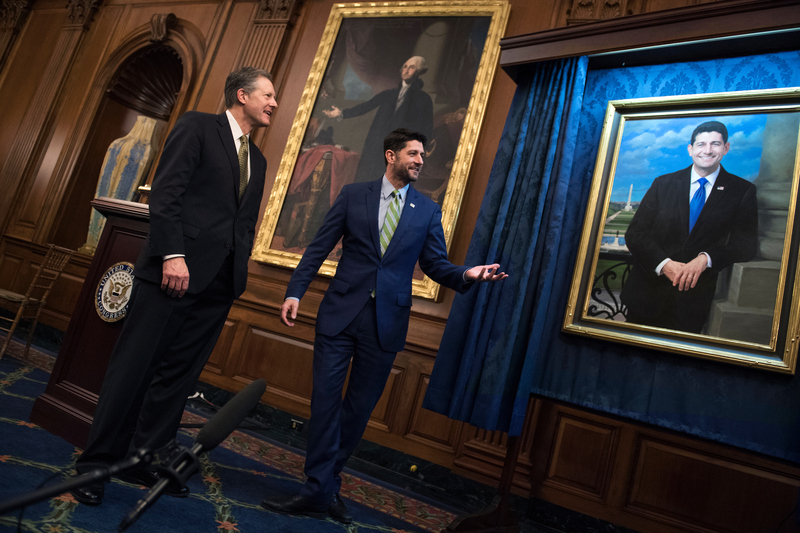 House chairman portraits, with price tags ranging from $25,000 to $50,000, depending on the size and artist, are not paid for with taxpayer dollars. Instead, lawmakers are tasked with setting up private portrait fundraising committees to solicit donations. Those committees often work with the U.S. Capitol Historical Society to cover the costs. Before the portrait unveiling, Ryan’s policy director, Austin Smythe, shared memories from his Budget Committee days, in particular, his boss’s irritation with the rising temperature in the room during hearings when it would be packed with members and staff. “It was way too hot for his Wisconsin blood,” Smythe said. Their solution: window units. But the folks at the architect of the Capitol weren’t too keen on the idea and agreed to cool down the building. “Next markup, man, did they come through. It was like an Arctic blast,” Smythe recalled. A member who worked on the floor below, angry at the sudden blasts of cold air, complained that his staffers had to wear winter jackets in the middle of April. Ryan had a message for his fellow Republicans who will be facing life in the chamber’s minority next year.